What is LCR Meter – an overview! LCR Meters are used to measure parameters of basic passive electronics components viz Resistor, Capacitor, and Inductor. 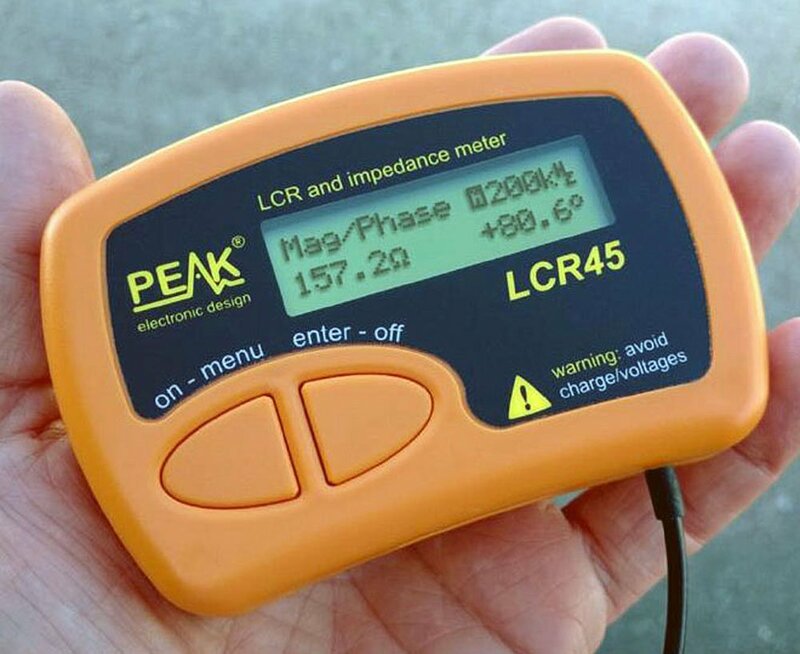 LCR meters are available as desktop meters and handheld meters. Handheld meters are basically used for portability, use in the field and also by hobbyists to have a low-cost alternative with limited accuracy. The basic functions provided by an LCR meter are â€“ Measurement Mode, Frequency of Measurement, Type of component (Inductor, Capacitor or Resistor). Most of the meters provide auto detection for component type and measurement frequency. Mainly we are interested in the following parameters of passive components â€“ 1. Inductance, 2.Capacitance, 3. Resistance / DC Resistance, 4.Quality Factor, 5.Dissipation Factor, 6.Series equivalent Resistance and 7. Parallel Equivalent resistance. Quality factor (Q) & Dissipation Factor (D) basically indicates theÂ purity of the component i.e. it indicates how close is the component to its ideal behavior. Q is theÂ ratio of power stored in theÂ component to the energy dissipated by the component. D is reciprocal of Quality Factor. Generally, Q is measured for Inductor and D is measured for Capacitor. Most of the LCR meters offer two modes for measurement Series Mode and Parallel Mode. Different modes are required as all the real world components have aÂ parasitic component in series & in parallel, along with its own value. Series mode treats the component under test as an equivalent series circuit whereas parallel mode treats the component as aÂ parallel equivalent circuit. If the impedance of the component under test is high then its equivalent series resistance is negligible and hence parallel mode is used. Alternately if the impedance is less, its parallel component is negligible and theÂ series mode is to be used. In other words, small value Inductors & large value capacitor should be measured in Series Mode and large value Inductor & small value capacitor should be measured by selecting Parallel Mode. Generally,Â theÂ component manufacturer provides details about mode and frequency to be used for measurement in the datasheet of the component. Additional details to be checked while selecting an LCR meter are theÂ range of test frequencies provided and test signal level. DC bias (Voltage /Current) is required to check component under conditions of actual use of the component in the circuit. LCR45 (by Peak) is a very compact, handy, light weight and easy to use instrument that fits easily in your palm. It operates on +9V battery. It can be used to measureÂ Inductance, Capacitance, Resistance and Impedance of the component and sensor. It also displays Impedance andÂ Admittance in complex number format and in the magnitude & phase angle format. In Auto Mode LCR45 can be used to detect the type ofÂ component automatically and also will select the appropriate frequency of measurement for a better result. In Manual Mode, you can selectÂ measurement frequency as per the component under test. LCR45 gives continuous reading making it suitable for alignment operationsÂ and also the reading can be put in hold mode for individual component measurement. LCR45 is provided with gold plated clipsÂ for minimum contact resistance resulting in more accurate measurement. 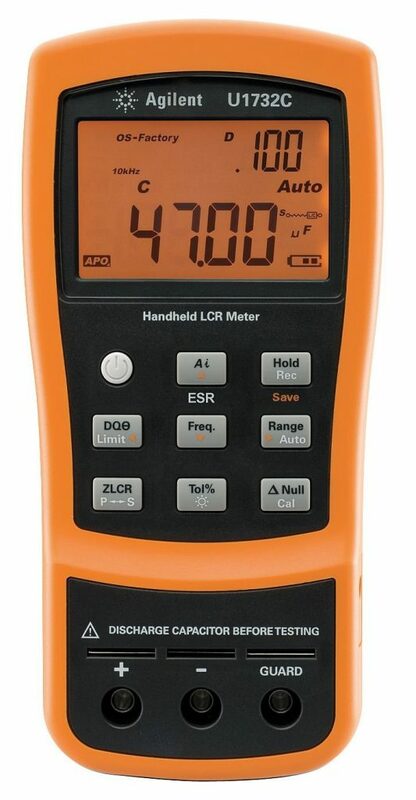 LCR45 has fairly good measurement range and accuracy. You can measure capacitance in the range of 0.5pF~10000uF at a resolution ofÂ 0.2pF and with an accuracy of +/-1.5%+/-0.6pF. For an inductor, the allowed range is 1uH ~ 10H at a resolution of 0.2uH and with an accuracyÂ of +/-1.5%+/-0.6uH. For a resistor, the specified range is 0Î© ~ 2MÎ© at a resolution of 0.1Î© and with an accuracy of +/-1%+/-0.6Î©. LCR45Â provides a good range of test frequencies viz â€“ DC, 1kHz, 15kHz and 200kHz. The operating temperature range is very tight: 10Â°C~40Â°CÂ LCR45 is a good option if you need to measure impedance or basic parameters of Inductor and Capacitor. It is also suitable forÂ applications where there is a need to align/adjust capacitance/Inductance/resistance. 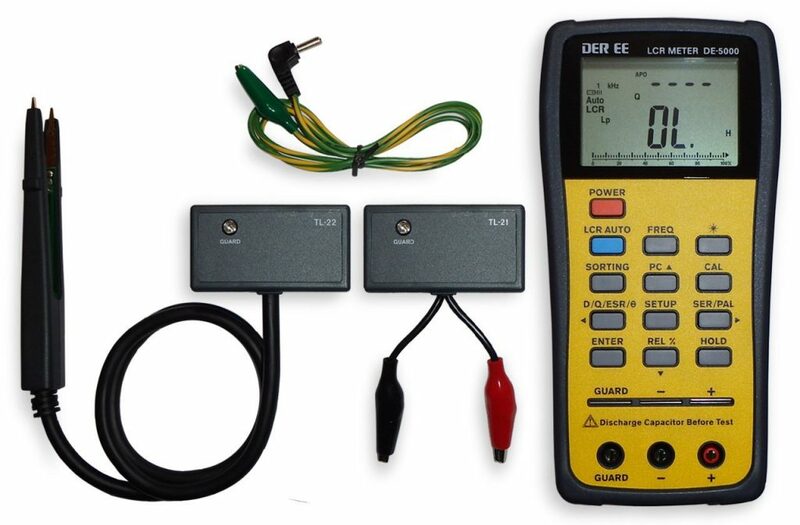 DE-5000 is a highly accurateÂ handheld LCR meter. It can beÂ used to measure â€“ Inductance,Â Capacitance, Resistance,Â Quality Factor (Q), Dissipation Factor (D), Phase Angle, EquivalentÂ Series and Equivalent Parallel resistance. It comes with a set of usefulÂ accessories â€“ Â 1.Test Leads, 2.Tweezers for SMD components and 3.Guard Line. However, the length of wires given for Test Leads is very short.Â The user can start working instantly using AUTO LCR mode to measureÂ without setting any parameter. DE-5000 has a very good featureÂ which helps to sort a batch of components by specifying toleranceÂ range. A wide range of tolerances is possible to be specified. DE-Â 5000 provides measurements in series or parallel mode and atÂ various frequencies 100Hz, 120Hz, 1kHz, 10kHz, and 100kHz. 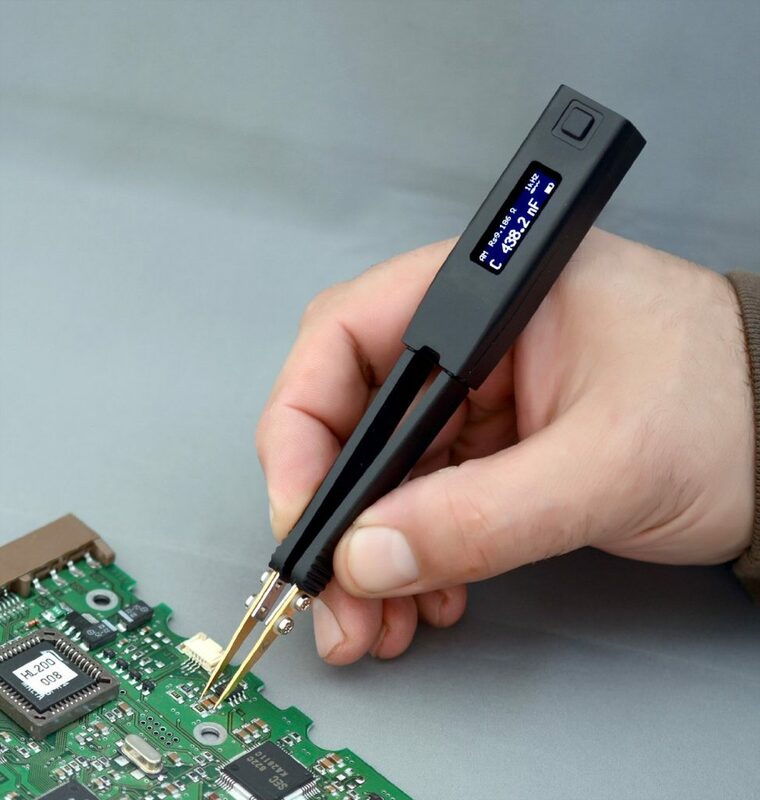 It has anÂ indication for the low battery which alerts the user on time and also hasÂ backlight function to have clear reading even in low light or darkness.Â Overall DE-5000 is a good alternative at an affordable cost for testingÂ the quality of passive components. Extech 380193 supports the measurement ofÂ Inductance, Capacitance, Quality Factor andÂ Dissipation Factor. It allows measurement inÂ Series and Parallel mode, however, the frequencyÂ of measurement is limited to 120Hz and 1kHz. ThisÂ meter can be used for sorting components byÂ specifying the acceptable range. For improvingÂ accuracy and reducing the error it provides a facilityÂ for calibration. The short and open calibrationÂ facility removes stray components added by theÂ measuring system. Extech 380193 allows displayÂ of the average, minimum and maximum value for a set of measurementsÂ and also provides the RS232 interface for sending measurement data toÂ a spreadsheet on PC. This helps to make an easier analysis ofÂ measurements. It supports dual display â€“ displays secondaryÂ parameter (D, Q etc) along with primary parameter (Capacitance,Â Inductance etc). It has the backlight feature for better readability ofÂ measurement. The battery required for this meter is non-standard, however, theÂ battery is provided with the meter as a standard accessory. Test leadsÂ are also included as standard accessories. The meter also has aÂ built-inÂ fixture for leaded components.Â Extech 380193 is a highly accurate LCR meter with good features at a moderate cost. ST5-S is specifically suitable for chip components. It can measureÂ Inductance, Capacitance, Resistance, Impedance and ESR inÂ Automatic (range and component selection) or Manual mode. ST5-SÂ can measure with 0.2 % accuracy. It has a nice OLED display and goldÂ plated Tweezer leads. The display can be rotated to make it suitableÂ for use by right hand or by the left hand.Â It operates on an inbuilt Li-Ion battery, and for charging the battery adaptorÂ is provided with the instrument. It is also possible to charge the batteryÂ using USB port.Â ST5-S is a good option for SMD component measurement but itÂ comes with a high price tag. 879B can be used to measureÂ Inductance, Capacitance, Resistance,Â Q, D, Phase Angle and ESR. The basicÂ accuracy provided by this meter isÂ 0.5% with 40000 counts for primaryÂ parameters and 10000 counts for the secondary parameter. Like all other LCRÂ meters, series and parallel mode ofÂ measurement are provided. It has niceÂ features for analysis of measurementÂ which includes min/max and averageÂ display, USB interface to logÂ measurement data and provides holdÂ function for easy reading. For the convenience of reading in the dark, a backlight option is provided. B&KÂ 879B LCR Meter can also be used forÂ sorting components by specifying the tolerance. It provides multi-optionsÂ for test frequency â€“ 100Hz, 120Hz, 1kHz and 10kHz with a test signalÂ level of 0.6Vrms. It operates with 9V battery and provision is given for using a DC adaptor also. When operated using battery, a Low BatteryÂ indication is provided to remind the user to replace the battery on time. TheÂ accessories include â€“ a Battery, a Mini USB cable, Test Leads and an Adaptor.Â B&K Precision 879B provides rich features with good accuracy for a handheld meter and the product comes with a moderate price tag. Agilent U1731C can be used for the measurement ofÂ Inductance, Capacitance, Resistance, Impedance,Â D, Q, ESR and Phase Angle. Both Parallel and SeriesÂ modes are provided for measurement. You canÂ select one of the following frequencies as the testÂ frequency â€“ 100Hz, 120Hz & 1kHz. For allÂ measurement, Auto Range selection is possible forÂ starting quick measurement. For better results, youÂ can select measurement range manually. The LCRÂ Meter can be used for sorting components by specifying theÂ tolerance from the standard value. U1731C provides the display ofÂ Min/Max/Average reading and also the user can freeze/hold the display.A backlight is provided for the LCD display to support reading in dark conditions. U1731C runs on aÂ 9V battery which is provided along with standardÂ accessories. The meter provides an indication for Low Battery to helpÂ the user replacing the battery in time. An external 12V adaptor can also beÂ used in place of the battery. For analysis of measured data, U1731C has an IR port. However, it needs a special cable to connect to the USB port of the computer.Â U1731C is a good option in Handheld meters with a high price tag. ItÂ comes with rich features and the only issue be the ng limited range of testÂ frequency.